A Daily Shower by Late October in Iloilo? 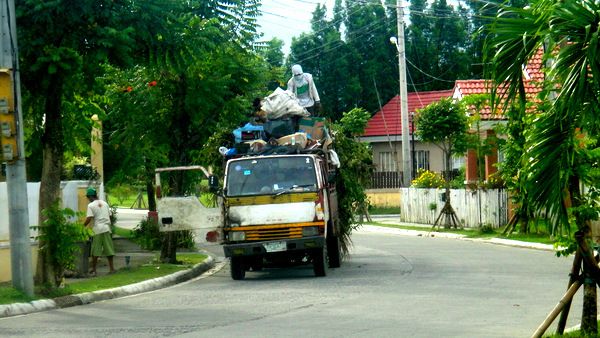 Our garbage guys were making their weekly run the other afternoon. Hadn’t seen them since last week and our trash was piling up faster than empty PBR cans on a redneck’s front porch. I rushed out to snag a couple of bags of rubbish we had kept hanging up on the side of the house since the garbage can was already full. As I stepped outside our three-bedroom-$140-a-month-rental home in our Iloilo subdivision, I noticed a small geyser (pictured above) which was pumping out gallons of water on our street. 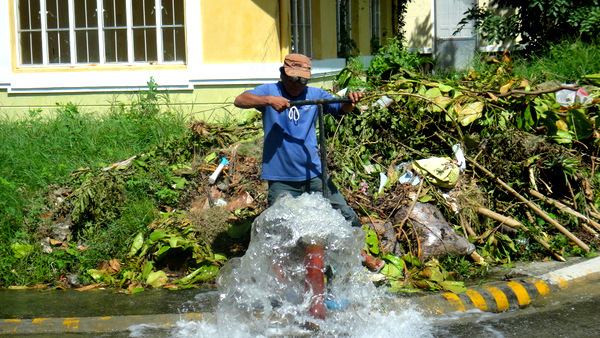 An employee from MIWD, the Metro Iloilo Water District, was already shutting down the flow of water when I snapped his picture. As our trash team (pictured below) picked up our rubbish, I stood and spoke to an employee of MIWD who was watching the water until it turned clear and he could see the chlorine. This was at 2:30 pm. With our water turned on in the morning, I thought it would have made more sense to flush it out then instead of the afternoon. But I kept that thought to myself. After 12 years of marriage to a wonderful but sometimes temperamental Filipina, I’ve learned to bite my tongue at times. I believe that practice has helped me to make it to the ripe old age of 60 thus far. I remarked to the rather hefty MIWD employee that I was speaking to that our water, which is only turned on every Tuesday, Thursday and Saturday, was working at 7:30 am the other morning. He informed me that they now have a water district employee on site at our subdivision. Complaints from residents prompted this new procedure. Before the MIWD assigned the on site employee, the laborer told me that the water was turned on at 9:30 am. I put my hand on the man’s shoulder and said: “But sometimes the water was not turned on until 10:00, 11:00 or noon.” He shook his head in agreement. MIWD extracts its supply from the Tigum River through an intake dam constructed in Bgry. Daja Maasin. The dam provides about 30,240 cubic meters of water per day. The employee I was speaking to advised me that this October 25, a project was in place to give all of Savannah Subdivision, where we live, a daily water supply. I was quite pleased to hear that report. But good news nonetheless. I told the MIWD employee that I could now take a shower every day and that my asawa would appreciate that. He smiled broadly and nodded yes. So there’s hope that I won’t have to keep using that little water dipper, a tabo (see photo above), to bathe myself the four days we don’t have water. Nothing beats a steady stream of cold water from a shower, especially while living in the tropical climate of the Philippines. And I have no doubt that a fresher, cleaner, less stinker kano will keep my asawa happy. You married guys know what I’m talking about. so as it is in the ph,if you live in low lying areas you get water but potential flooded out from rains and if you live high and dry,well i guess you stay dry,hhmm. What happened to the new recycling trash deal?has it not started yet? Yeah, but there’s something I can’t figure out, Scott B. If our subdivision is so elevated, how did it incur so much flooding damage from Typhoon Frank in 2008? That doesn’t jive with what the guy from MIWD told me. That first cold ladle in the morning…nothing like it! I will be staying at a boarding house with my g/f while her house is being completed. 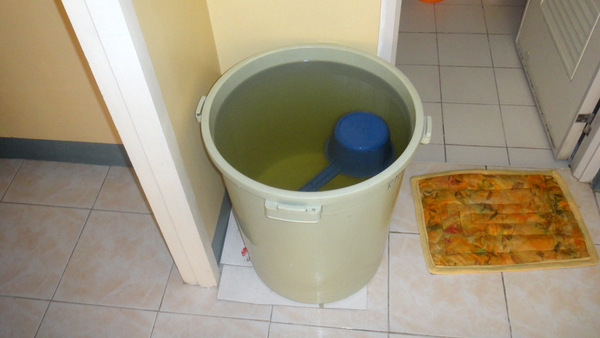 They use a tabo for baths and bucket for toilet. They have water to the house, but the 82 year old lola that runs it is trying to save money on water. But she’s getting a shower head and the water turned on for the kano. It’s nice to get treated like a king lol. Hopefully you will have fulltime water in October. Thats a great idea for the outdoor shower. Have a nice day.